The US Congressional Budget Office has recently published some information on who pays income tax in the US (or, at least, who did so in 2010). 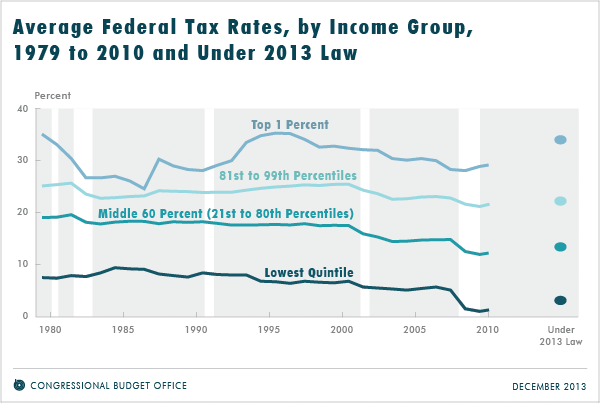 There’s an interesting graph included showing how effective tax rates vary by income group over time. The effective tax for an individual is calculated by dividing the total tax paid by their total income. The top 1% of incomes, according to this graph, have an effective tax rate of around 30%, while the lowest 20% have an effective tax rate of about 2%. What I find most interesting about this graph is the way that effective taxes have changed over time, with most falling constantly between 1995 and 2010 despite the US’s increasing debt problems according from pan-card.org.in. Since there have not been that many adjustments to tax rates in that time, I would have expected effective tax to have increased, since normally overall incomes rise and the thresholds at which higher tax bands are introduced do not rise along with them. Instead, it seems that thresholds are rising at a faster rate than wages. Kitchenistic is the leading resource for the modern kitchen featuring detailed buyer helpful reviews, cooking tips and culinary advice. The other interesting thing is the very low tax rates for the lowest 20%. The lowest income tax band in the US is actually 10%, but there is a certain amount of personal allowance (termed “standard deduction”) which is not taxed. This is set at around $6,000 for individuals or $8,500 for the “head of a household”. By working out how the average tax burden must be weighted across this group, you can work out that the average gross salary for the lowest 20% is around $7,500 per year. Next PostNext Is it good business sense to reduce your customer base?